For those of you that know me IRL, you know that I have been amping up for Stand Down 2012, an annual event that provides food, shelter, and a myriad of services to homeless veterans. This year will be the 25th anniversary of its founding by Don Nachison and Robert Van Keuren. Stand Down is designed to help homeless veterans "stand down" from combating life on the street and to meet both basic human needs and to help them achieve a process that is known to many as self-actualization. Think of it as the ultimate form of personal growth and achievement. Our motto at Stand Down? "A hand up. Not a hand out." 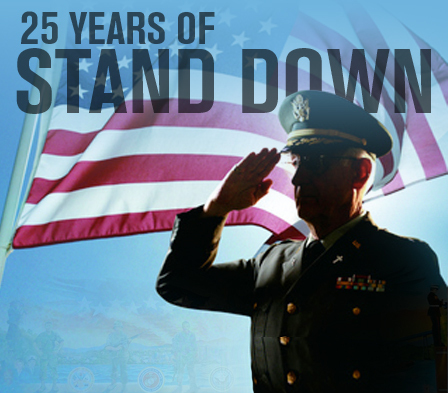 Stand Down operates according to the principles of basic human needs and the power of motivational experiences. As human beings, our physiological needs come first, because they are biological, chemical, instinctual, and they are necessary for survival. Even in the trenches, soldiers take a moment to fulfill these basic needs. Unfortunately for many homeless veterans, they struggle to procure food and water and it is difficult to find a place to rest. It is even more difficult to find safety. So, for three days, starting tomorrow, Stand Down provides all of these things to the homeless veterans willing to come through the gates. Once these needs are met, the vets are able to begin opening themselves to new possibilities and new avenues for inspiration and support. While at Stand Down, I feel like time has stopped. I focus on keeping my guys hydrated and getting to know "Stand Down Babies" who are new to the scene and itching to reclaim their agency and dignity. I get to reconnect with former participants-turned-volunteers and watch old comrades reunite. Stand Down is about family, and for those three days in the middle of July, I feel more at peace that I do sometimes in my regular life, regardless of the blistering heat. My first year, the sun was brutal and it was so dry. Last year, we had some pleasant cloud cover and a little light sprinkle here and there. I am really looking forward to this weekend because the weather is predicted to be perfect this year! Although the rules for visiting during Stand Down have become more stringent, if you are already a fellow tent leader or volunteer and you read my blog, come by Foxtrot and say hello. It is where you will find me and my fellow tent leaders, K and V, every year. Even when I eventually move away, you will still find me here each July. While volunteerism is one of my core values and it is certainly a passion, none are more rewarding to me than these three days each year. Stand Down is my summer lifeblood, and I am so glad it is finally here. If you are interested in learning if there is a Stand Down in your area, visit the Department of Veterans Affairs website. To watch the 60 Minutes special on Stand Down in San Diego, click here. Also, visit the National Coalition for Homeless Veterans to learn about how you can help shape public policy and support collaboration between business and service providers to help end homelessness among veterans. What a wonderful event! Such a wonderful thing you are doing for those veterans, what a blessing! I hope you have beautiful weather and that many veterans come out! Wow that sounds awesome! That's a great thing to do, and hopefully your weather operates perfectly for the event!